Microsoft Azure Websites is Pure Awesome. The speed and amount of work that can be done in a very short period of time is just amazing. Today, I’m sharing a feature that I’ve been waiting for, for a long time. Wildcard support for DNS and SSL Certificates. In the past, you could use a wildcard certificate, but because Wildcard DNS wasn’t supported, you had to manually enter your sub domains one-by-one. This doesn’t scale very well. 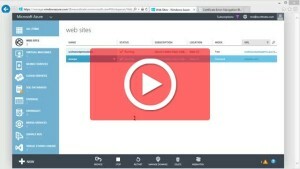 In this screen cast I show you how to setup a *.Wildcard DNS and SSL under an Azure Website. It’s just shy of 5 minutes. These days, a Git Repo is where all of my source code lives. Both for personal, and work, both for open source and private repos, and with all my Git Repos online, I’m split between Git Hub and BitBucket. Both have their pros and cons, but that’s another discussion. Every time you push or pull code, your command line needs an origin. All the samples on GitHub and BitBucket, and most books call this “origin” for lack of a better term. I have recently started renaming “origin” to “github” and “bitbucket” then when I’m pushing/pulling code, I know where it’s coming from or going to. You could argue that it doesn’t matter, it’s going external. That’s a valid point. I would argue back that tab+tab auto completes it for me so it’s the same keystrokes (assuming only one origin, which I think is most common). AND now I have mind share where the code is going, if I need to log into the admin panel. Silverlight of Yesterday–Saves me today! Silverlight is an awesome product. As Flash is awesome and it’s glory. Silverlight is nicer for me, as I think in C# v. Action Script. That said, at work, we use the Adobe plug in model for quite a bit, it’s just not something I am personally familiar with. I have always been a fan of screen casts, and over the last few years, I have been using the http://looplogic.com screen recorder. ON a few screen casts, I wanted to record my printer printing, using my Desktop web cam. So I started looking for a web site, that simple turned on my web cam. There are lot out there, but that meant I had to show that website, inside my screen cast, just to show my camera. I recently moved ScottCate.com from my old hosting provider to Windows Azure Websites. It was so fast and simple, I wanted to do a srceencast showing just how easy it was. If you’re interested in blogging, or using WordPress for anything, you owe it to yourself to give this a shot. On October 21st around 6pm Pacific time, our Azure CDN was gone! It came back a few hours later, but I started digging into a solution that would help mitigate this in the future (this post). Instead of the CDN serving content, it was serving 400’s (Bad Request). When something like this happens, we call it an outage, though that isn’t always the case. There are millions of dependencies in Technology, and if Just one breaks, it can have catastrophic down line damages. So our goal in Cloud and Scalable software is to allow for failure, understand where/when it can happen to the best of our ability, and make backup, fallback routines to handle that failure. These could be automated, or manual, but the more you have in place, the faster your app will come back online when a failure happens. Notice I said when, not if. Plan for failure sooner than later, and you’ll be better prepared. What could make our CDN just go away? More on that later. How to solve the problem. We put our thinking caps on and …. come up with a solution.